**THIS INFO IS FOR ARTIST REGISTRATION ONLY** visitor tickets are only $20 (admits 2) and will go on sale in January, 2019. Artist registration is now open! Artists you have until October 31st to register for the premier art event in Tulare County! Please click here to join the tour! Show and sell your art in the comfort of your own creative space on Saturday, March 30 and Sunday 31, 2019 during our South Valley Art Tour. At this event, you will help us increase the value of the arts in Tulare County by providing our community with 1) the opportunity to further understand the value of your art through demonstrations, 2) insights into your individual creative processes, and 3) a behind the scenes look at the different phases or facets of your work. The SVAT also 4) allows you to answer questions and make more personalized relationships with prospective clients. WHAT HAS CHANGED: Due to popular demand, the Arts Consortium’s biennial South Valley Artists’ Studio Tour is now an annual event which we are calling the South Valley Art Tour. Along with the change to our event’s name, our 2019 South Valley Art Tour will feature artist studios located SOUTH of Highway 198. If your studio is located South of 198, we would love to have you on the tour. If your studio is located North of 198, we will be featuring you in 2020. Studios along Highway 198 located east of Lake Kaweah will be considered part of the Northern studios. WHAT HAS STAYED THE SAME: Registration to our South Valley Art Tour is still only $50.00. Also, if you are located on the North end of Tulare County or you don’t have a studio space of your own, feel free to combine your creative forces and show space with other artists. If you do not know someone who might host you, we can help find you a shared space! All artists must register individually, before October 31st in order to be included in our printed promotional materials. No exceptions will be made. Registration fees are non-refundable. Sign up for the South Valley Art Tour Today! 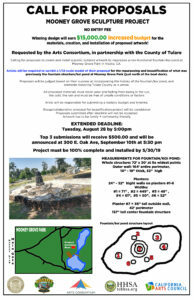 Calling for those interested in creating and installing a public outdoor artwork to repurpose a non-functional fountain/koi pond at Mooney Grove Park in Visalia, CA. 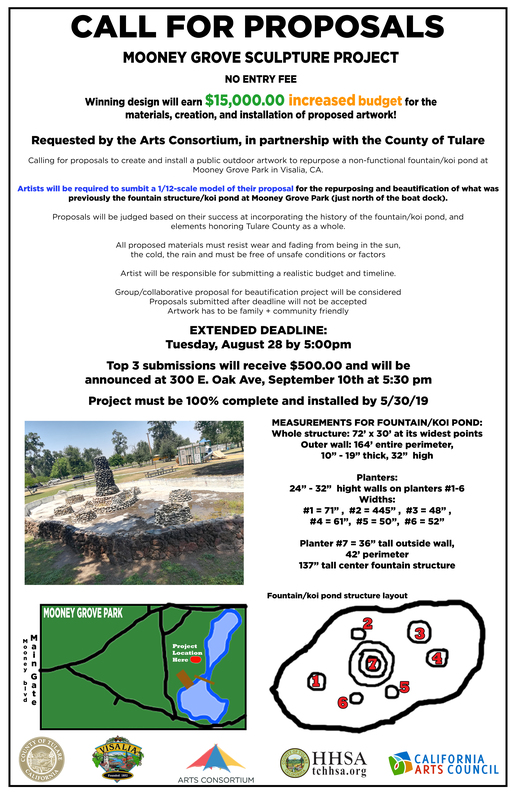 This is a call for 1/12-scale maquettes as proposals for the repurposing and beautification of what was previously the fountain structure/koi pond at Mooney Grove Park (just north of the boat dock). Proposals will be judged based on their success at incorporating the history of the fountain/coy pond, and elements honoring Tulare County as a whole. ELIGIBILITY: Artist must be a resident of Tulare County. Must be 18 yrs. or older or have parent/guardian consent. 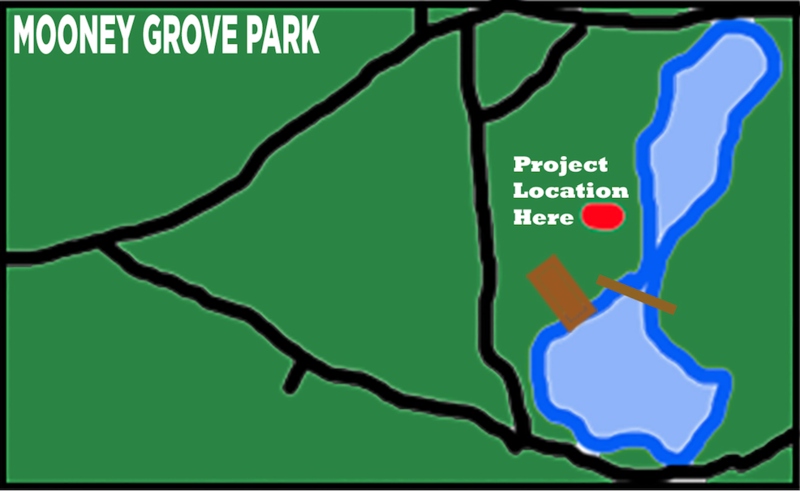 This project requires that the model must be 24″ wide and to scale. Artist will be responsible for submitting a realistic budget and timeline. Arts Consortium panelists will choose the top 3 submissions to receive $500.00 prize each. The Tulare County Board of Supervisors will choose the ideal candidate from the top 3 proposals to receive a $10,000.00 budget for the project’s execution, materials and installation. The model must be 24″ wide and to scale. Tickets (Passports) Are now at the Arts Consortium. The South Valley Art Tour!